Artists see the world a little differently than those around them. On a blank canvas, for example, they may see the makings of a serene landscape, done in brilliant watercolors. In a ball of clay, they may envision a fully formed ceramic creation, kiln-fired to a smooth sheen. In an untouched block of stone, they may imagine a perfectly sculpted statue, with every curve captured in exquisite detail. Drs. Lynch and Wisser lead the surgical team of Princeton Rejuvenation Institute in East Windsor, N.J., where they use a blend of artistry and surgical skills to sculpt, shape and otherwise beautify the human form. The practice offers a full spectrum of cosmetic services, ranging from skin care and minimally invasive aesthetic procedures to cosmetic and reconstructive surgery of the entire face and body. Yet no matter the mode of intervention—a rhinoplasty or a facelift, a breast augmentation or an abdominoplasty, cosmetic injectables or medical lasers for facial rejuvenation—the surgeons strive to deliver a clear path to achieve the natural-looking results each patient desires. Drs. Wisser and Lynch share an interest in the space where art and medicine intersect. Dr. Lynch used his surgical skills to correct facial deformities in pediatric patients—namely, cleft palates and cleft lips—early in his career. He later found himself drawn to other aspects of plastic surgery, specifically breast reconstruction following mastectomy or lumpectomy, augmentation and breast reduction, which remain his particular areas of specialty interest. Dr. Wisser, on the other hand, was intent on his career path at a young age. Backgrounds in the fine arts underlie the surgical approach for both surgeons. Throughout Dr. Wisser’s life, for example, he has worked with media including charcoal, pencil, watercolor and sculpture. These skills have proven to be extraordinarily useful when evaluating patients. Princeton Rejuvenation Institute is a throwback of sorts, offering a modern “boutique” environment where individualized care is their primary focus. Every patient interaction is conducted by a board-certified plastic surgeon, either Dr. Lynch or Dr. Wisser, along with support from their staff. Gabrielle Perret, their medical aesthetician, has comprehensive training in both Switzerland and the U.S., and prides herself in creating programs with the doctors for optimizing patient results. This leads to long-lasting patient relationships as they enjoy a variety of aesthetic services throughout the center. The surgeons perform most procedures at the practice’s onsite ambulatory surgical facility, Reliant Surgical Center, LLC. The center is certified by Medicare and fully accredited by AAAASF. The physicians and staff are committed to providing patients with a safe and comfortable environment that encourages active patient and family involvement. They specialize in the treatment of patients who have either failed to respond or experienced difficulties with prior treatments. Drs. 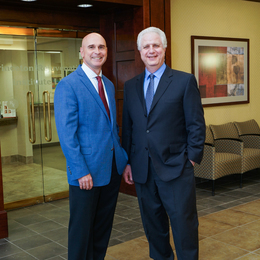 Lynch and Wisser believe in educating their patients so they can make informed decisions. This includes a detailed explanation of patients’ options, from minimally or less invasive interventions to more dramatic surgical modalities. The surgeons and staff even provide their personal cellphone numbers, and patients are encouraged to reach out with questions or concerns at any point in their treatment. Working closely with patients and making certain their needs are being met, both physically and emotionally, is in itself an art form.